Israeli ground troops and tanks cut swaths through the Gaza Strip early Sunday, cutting the coastal territory into two and surrounding its biggest city as the new phase of a devastating offensive against Hamas militants gained momentum. The military used overwhelming firepower from tanks, artillery and aircraft to protect the advancing soldiers, and Gaza officials said at least 31 civilians were killed in the onslaught. The military said troops killed several dozen militants, but Gaza officials could confirm only four dead — in part because rescue teams could not reach the battle zones. Israel reported one soldier was killed by mortar fire on Sunday — the first Israeli death in a ground offensive that so far has been widely popular with the Israeli public. Israeli troops advanced into Gaza on Sunday under cover of heavy air, tank and artillery fire after opening a ground war against the militant group Hamas on Saturday night. Witnesses said the Israeli forces had punched across Gaza, bisecting its northern and southern parts, and had taken over certain strategic areas, including what the military has described as rocket launching sites. The ground campaign came after a week of intense airstrikes. Israel’s stated goal was to destroy the infrastructure of Hamas, the Islamic group that controls Gaza’s government, and to significantly decrease the threat to southern Israel from Palestinian rocket fire. In a telephone briefing for a group of foreign correspondents, a senior Israeli military official said that Israeli troops would hold the areas they have taken inside Gaza at least for the duration of the operation to prevent militants from returning to fire rockets from there. Israeli ground troops and tanks cut swaths through the Gaza Strip early Sunday, bisecting the coastal territory and surrounding its biggest city as the new phase of a devastating offensive against Hamas gained momentum. Thousands of soldiers in three brigade-size formations pushed into Gaza after nightfall Saturday, beginning a long-awaited ground offensive after a week of intense aerial bombardment. 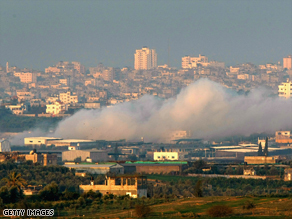 Black smoke billowed over Gaza City at first light and bursts of machine gun fire rang out. In his first public comments since the ground operation was launched, Israeli Prime Minister Ehud Olmert told his Cabinet on Sunday that Israel could not allow its civilians to continue to be targeted by rockets from Gaza. “This morning I can look every one you in the eyes and say the government did everything before deciding to go ahead with the operation,” he said. Still, he said, “We have no intention of staying in the Gaza Strip for the long term.” He spoke on condition of anonymity in accordance with army regulations. TV footage showed Israeli troops with night-vision goggles and camouflage face paint marching in single file. Artillery barrages preceded their advance, and they moved through fields and orchards following bomb-sniffing dogs ensuring their routes had not been booby-trapped. The military said troops killed or wounded dozens of militant fighters, but Palestinian medical teams in Gaza, unable to move because of the fighting, could not provide casualty figures. Hamas said only three of its fighters had been killed, and Gaza health officials said eight civilians also died, including a 12-year-old girl in the northern Gaza town of Beit Lahiya and four family members killed in an airstrike in southern Gaza. EREZ CROSSING, on the Israel–Gaza border — As Israel’s tanks and troops poured into Gaza on Saturday, the next phase in its fierce attempt to end rocket attacks, a question hung over the operation: can the rockets really be stopped for any length of time while Hamas remains in power in Gaza? And if the answer is determined to be no, then is the real aim of the operation to remove Hamas entirely, no matter the cost? Vice Premier Haim Ramon went even further Friday night in an interview on Israeli television, saying Israel must not end this operation with Hamas in charge of Gaza. Neither Prime Minister Ehud Olmert nor Defense Minister Ehud Barak has made such a statement. Still, there is a growing and shared concern among Israeli leaders that any letup against Hamas would be problematic for Israel’s broad goals in the long term because it could bolster and validate the group, which says Israel should be destroyed. In addition, any potential truce deal would probably include an increase in commercial traffic from Israel and Egypt into Gaza, which is Hamas’s central demand: to end the economic boycott and border closing it has been facing. To build up the Gaza economy under Hamas, Israeli leaders say, would be to build up Hamas. Yet withholding the commerce would continue to leave 1.5 million Gazans living in despair. You are currently browsing the archives for the ground category.